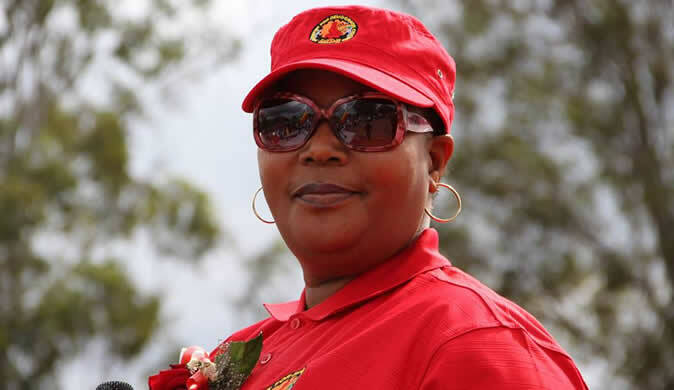 MDC-T leader Thokozani Khupe has assured her supporters that she was still in the presidential race, dismissing speculative social media reports suggesting that she had withdrawn her candidacy to support Zanu-PF's President Emmerson Mnangagwa. The claims, which were posted on a social media platform, Twitter, running under the page "Exposing Zimbabwe Election Rigging 2018", quoted Khupe's deputy, Obert Gutu as the source of the report. Part of the message read: "…We are weighing our options to rally behind ED and Zanu-PF on the presidential campaign, we have our team on the ground campaigning and soon we will make a big announcement. Some will say we betrayed the electorate but the fact of the matter is that we have found nothing wrong with the new administration. "We believe ED is reforming and we will rally behind him, we want to taste his new approach, so we will soon withdraw our presidential candidate Thokozani Khupe to put our weight behind Zanu-PF and ED", it read. But, Gutu yesterday described the reports as fictitious and meant to tarnish the party's image ahead of the July 30 elections. "It has come to my attention that there is a Twitter #hashtag claiming to have had an interview with me, in which I am alleged to have stated that we are going to withdraw the presidential candidature of Thokozani Khupe in favour of President Emmerson Mnangagwa of Zanu-PF. "I believe whoever is behind this is obviously someone who is evil and is pushing a sinister agenda against myself and our political party in general", he said. Gutu said he was not interviewed by any journalist or anyone. "Let me reiterate that there is nothing like that, I never had any interview with anyone or any journalist in this country or anywhere in the world for that matter in which I stated that we are withdrawing our presidential candidate. "Let me put it on record that there is a lot of fake news that is spreading on these social media platforms and I would like Zimbabweans to be very cautious of what they consume in terms of news content, this is not the first time that this has happened, I have taken this opportunity to come out and set the record straight," he said. According to the party's Twitter posts on @VoteMDCT2018, MDC-T is not working with Zanu-PF, has never worked with them and has no arrangement with the party. The opposition party also refuted allegations that it was a regional party. The party's Dangamvura/Chikanga parliamentary candidate Lynette Mudehwe told journalists in Mutare at the weekend that Khupe had fielded candidates in all provinces to prove the party was national. "I have been invited here in Mutare as a political party not in Bulawayo. I am representing my president Thokozani Khupe, I am standing as an aspiring MP for Dangamvura/Chikanga constituency,'' she said. In May, Khupe's MDC-T, Dumiso Dabengwa (Zapu), secessionist Mthwakazi Republic Party (Mqondisi Moyo), Lovemore Moyo's United Movement for Devolution (UMD) and Moses Mzila Ndlovu's Alliance for National Salvation (Ansa) attempted to form a regional pact, but the talks collapsed after Khupe allegedly demanded that the coalition should run under the MDC-T banner.